"Im not Blue over these Jeans"
"Offers video meetings with clear image"
I like it because it is easy to use, offers video meetings with clear image and clear sound, integrates very well with google calendar, which can share screen and choose which part of the screen you want to show to others is something else useful by which you can show a document, graphics and even a presentation, is a great tool for any company that needs to improve its internal communication, excellent for tutoring and teaching, but also to be communicated with remote workers. Sometimes the sound fails when there are many people in a meeting, echoes and interferences are heard. Bluejeans is a complete solution for business communication, integrates itras tools that I use to improve the experience and has a competitive price. A software as few, it is easy to organize meetings with IT employees who work in other offices, when I work remotely by visiting computer centers I can participate in any group meeting or attend an online interview from my mobile phone, to communicate with the technicians and technologists who need my assistance or direction to face a complex problem, just sharing the link of the meeting I can invite different specialists to the meeting and they can in turn connect from any device and where they are, improves not only communication but collaboration between colleagues. "Very attractive and intuitive interface"
I like it because it is very easy to use thanks to a very attractive and intuitive interface, you can record and save meetings and interviews easily, has several display options according to what is needed, has a mobile app that allows you to do mib work on the move and out of my office if necessary. A few times we've had interference problems and intermittent sound. It is a very interesting software and you should always have updated to avoid problems. I use Bluejeans very often to interview with applicants for jobs within my company, I must study their skills and request documents, thanks to Bluejeans I have the ability to study the gestures and movements of the other person by offering me high definition video call, during the interviews I can go through the documents you send me and evaluate them, in phase 3 of preparation I give support talks and training for 50 new employees. "Unified communications with high quality. " Currently, given all the advances in technology, it is likely that we work both at home and in the office, or that we spend a good part of the day with clients and allies. BlueJeans what it does is facilitate these processes through a service that allows to be together, call or listen with high quality both image and sound, from virtually any device or place. In our case, we also provide training that is very useful for us. Their various services are useful by themselves and as a whole I believe they provide a great solution to maintain contact between the team, partners, allies and especially with customers. I also consider that its use reduces the expense in other means of communication that becomes unnecessary. Practically nothing can be said in terms of functionality, perhaps the differentiating element is that its value per organizer is above average. If one wishes to use it for other smaller professional activities it can be expensive at first. Well I think BlueJeans offers everything you need for communications. Allows you to enjoy the platform for free for your evaluation and observe that way if it responds to the needs of the organization. Its quality is above average. In my case it has always worked excellent. Team with allies and suppliers. It allows to establish a conference space that is easy to manage, with quality in every sense. In the same way it allows to reach more public and prospects through its events which are extremely easy to handle. "Latest Bluejeans Update is Buggy"
I like the ability to share my screen and video conference with colleagues no matter how far away they are to make it easier to collaborate. The latest update is a little buggy, you get disconnected without warning, you stop sharing without warning - now that the feature of what app or document you would like to share - you forget and change to something different and then others cannot see your presentation. I don't see an option for sharing the entire desktop instead of having to select an application. Make sure to tell everyone at the beginning of a meeting to speak up if your screenshare stops. The new feature for selecting the application or document to share is not as user friendly as allowing you to share your desktop to avoid this issue in the future. We use it to collaborate with other team members near and far....sharing documents, resolving issues, video conferencing, etc. "Blakes Review of the BlueJean - New Relic"
Loads fast and doesn't require much configuration at all. I also like the user interface of Blue Jeans. It's very sleek and not hard to figure out how to use on your own. I also like the integration with Gmail to easily send the Blue Jeans link in a calendar invite, it make it very convenient. Also, the mute button is my absolute favorite, being to speak with my colleague in the same room while on the call with my prospect to discuss game plan is extremely useful during the call. Sometimes the people joining from the weblink have trouble. I've had numerous times where I have tried inviting someone to my meeting for a disco call or demo and they show up 10 to 15 minutes late because they were not able to join using the web link which is annoting. It is very straight forward, the ease of use will give you no trouble. Send the link in a calendar invite though, something my contacts have trouble joining from the web link. Being able to screen share with our customers. Being able to show them what I'm talking about. Being able to present a demo very simply without going on site is great. It almost acts like a second confirmation adding the link to the calendar invite because they feel more obligated to join the call if they did not initially feel like it. "Remote conferences without the heartburn"
Bluejeans just works. It is an easy setup, easy to start meetings and audio/video/presentation works well. Using internationally is also very easy, with minimal delay in audio and only a slight lag in changing slides for screen sharing of slides. The switch to phone feature works well, but it doesn't work properly when host is in Asia and users are in North America. You must manually dial in. I am sure this is a cost issue not being to have the software call me in North America, when the meeting originates in Asia. BlueJeans is just easy to use and provides a simple interface to do audio, video and shareable desktop presentations. I find the audio quality to be very good compared to Skype. Although I do find other options, GoToMeeting, etc, to be decent, I find BlueJeans to be the best available and easiest to use. Conferencing between Asia, North America and Europe, simultaneously, on PC, Mac or smartphone. Time to get into meetings is reduces, echo and lag of audio is less and sharing slides is much easier. "It's a good web bridge"
I like that the UI is very easy to use. cool colors, and easy recordings. Better than GTM on recordings for sure. I also like how the UI can be perfect in some ways. The logo is easy to find on the desktop. no Crashes. I wish that it was somewhat more simplistic, like Go To Meeting. I also have had a lot of complaints about customers downloading the link, and dropped calls. I switched to GTM and never had issues. I sometimes have network failures so I have to dial in. It's not the worst part, but sometimes I wish we could send over a link for them to just dial in so we can talk on the phone. Maybe that is something we can do. I haven't really tried that part of the Blue Jeans software out just yet. BlueJeans get's the job done. I hear good things from customers and the UI is easy to use. Business problems? I would say trying to show customers their usage and accounts by sharing screens. The benefits are visualization and walking through account + Demos are very valuable. When we do provide a demo to of our software to customers then they can really see the value in our product. Blue Jeans makes that happen for us and we rely on screen sharing to improve our business and increase our customer retention. "Blue Jeans — The Good and Bad"
I most like the calendar functionality to click a button and have it set the dial in information automatically in the invite. My other favorite thing is when calling in from your phone, it auto puts in the code for you when you click from the link. It's so difficult on the go to stop and copy the code from your email and put it into your phone. The general UX/UI and design of the program is beautiful and really easy to navigate. It's hard to review a meeting from a calendar invite once set up. You have to delete the original invite all together instead of just editing. Occasionally the system as a whole will go out and we will have to set up a meeting another way, although that is very rare. Give it a try! It's really smooth. It creates easy meetings that both remote and in office employees can easily attend. It's much more simple to use than other softwares I've tried, and it stops the struggle of having to remember or write down dial in codes before calling in on your phone. It's great while commuting! It's video meetings are nice too, and I like that you can use it as video, phone, mobile, etc. No matter what device you're using, it makes it easy to get in. The biggest problem it solves is just pure efficiency. "Convenient, easy to use, reliable"
It's easy to use. I've had much fewer issues with people joining meetings, being able to mute them, and similar aspects than what was available when we were using GoToMeeting. Also, screen sharing is very easy, and I like the permanent personal meeting number that I can use at any time for an impromptu meeting with someone. I like the "screen sharing only" function, which is useful if a conversation begins on the phone, and then you realize you need to share something, you can avoid disconnecting and reconnecting for audio by choosing "screen share only." Finally, the sound is very clear. This is the most frequent comment I've gotten from attendees about BlueJeans compared to other products. The biggest issue is that the chat box needs to be separated. This is especially important when I am screen sharing and I want to do a private chat with someone -- I can't, because the chat shows on the screen! This is a major flaw. Also, if I want to chat while screen sharing, when I click on the window to chat, it covers up what I was sharing and the whole BlueJeans window comes up front. Also, I don't like it that I can't copy the meeting numbers in my BlueJeans desktop app in order to share with others (except my personal meeting ID, which is copiable) -- that's a repeated nuisance. Similarly, in version 1 I could copy the chat box contents to keep for a meeting record, but in version 2 they won't copy. Finally, I'd like to be able to schedule meetings within the app. Currently, it forces me to go to a web page to do that. All of us at our company are happy with BlueJeans. 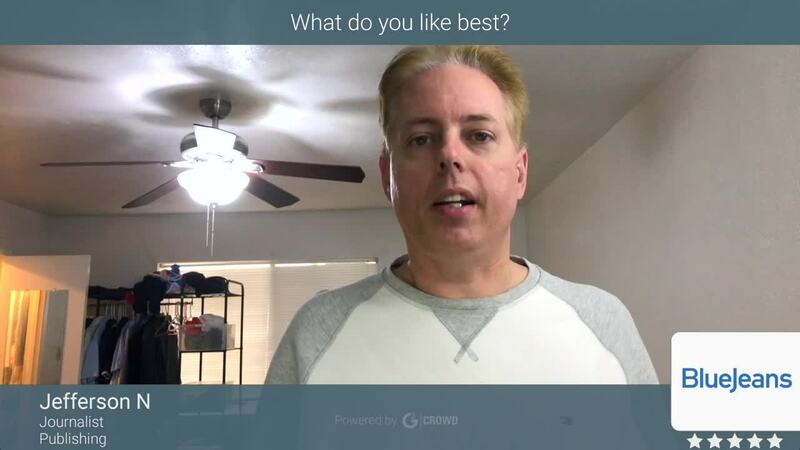 While it's not perfect, I've used GoToMeeting and BlueJeans to run meetings, and have been an attendee in those two plus WebEx and Zoom, and BlueJeans is my favorite of the four. The most important thing I can mention to consider is whether or not private chats while showing your screen is an important feature for you, because that's missing here. We're a 100% online business with everyone working out of their homes scattered across the country; this is the way we meet. I also do quite a bit of technical assistance for employees and clients, and being able to see their screen is greatly helpful in resolving issues. The platform has a simplistic design that makes it easy to find the features you are searching for during a call. The various display options are also convenient, as you can select the view that best suits the purposes of the meeting. The live chat is a great way for participants to interact without feeling the need to jump in and potentially talk over someone who is about to share out. This feature also provides participants a way to validate others' shareouts, especially since it is not always possible to view all of the call attendees on a single screen. As a moderator, it is convenient to have the capability to mute participants' microphones and video feeds. BlueJeans does not consistently work well for all users. As someone who frequently interacts with remote employees, I find that the connection isn't always stable for others. There are times when it takes a long time to access a call after clicking the "join meeting" button. In addition, it is not as user-friendly as it could be to individuals who are not super tech-savvy. I have had to coach others through various issues like signing into the call twice, what to do when the video feed does not appear, etc. Calls held on BlueJeans are more similar to in-person meetings compared to other virtual meeting platforms. I have found it to be especially impactful when three or more people are expected to attend. Throughout my use with Bluejeans I have always most appreciated the easy to operate a interface. Unlike other platforms Bluejeans allows me to easily connect with my associates as well as interview potential hires while on the go. 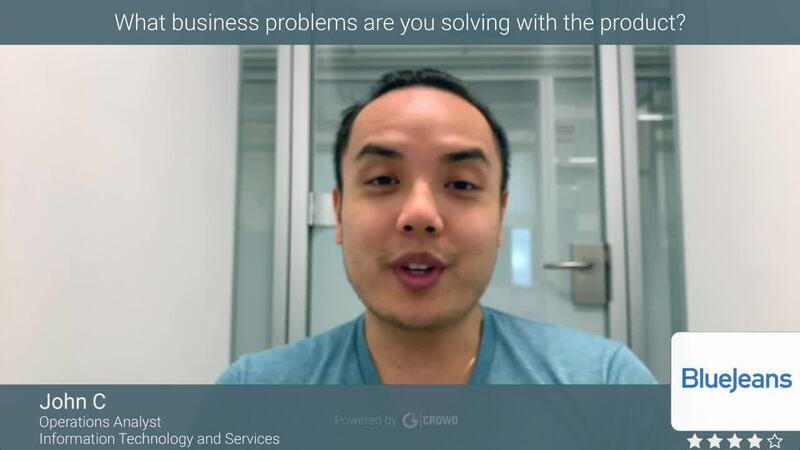 Despite the great user face I have noticed that I often lose service while working with Bluejeans on the app the sound quality is poor and the overall quality of the service lessens. While I can do most of my work by using the desktop setting the app makes it difficult to meet with others that use the app. I have had to notify colleagues not use the app version if we are going to use Bluejeans. Correct the mobile app so that communicate can be seamless regardless of access point. Bluejeans allows me to effectively communicate with my work associates in a quick and reliable manner. Despite the lacking of the mobile app I have come to like Bluejeans if I know both parties are using a desktop. Blue jeans provides a simple and reliable platform for online meetings. I have had virtually no issues with Blue jeans compared to the other major players. Works well with phone integration. Sharing documents is easy. The video quality, when we use it is very good. We mainly use audio, either phone or online, with the online document sharing. The only complaint I have is that phone integration does not seem to work as intended if host is in Asia and clients are in North America. You have no issues if you use online audio, but using phone will not occur seamlessly and is not attached to your online presence. This is minor, but a nice feature when. It works. We get around this by just calling in manually. For USA meetings, it is very easy to switch between online audio and phone audio. Also, very minor, and I know this is not fully solvable by BlueJeans, but audio lag is there and this does cause issues when talking between Asia and North America. Solid option for conferencing. Seems expensive to me, but I am really only a user. Online meetings, including audio and presentation between teams in Asia, North America and Europe, simultaneously. We don't use the video often, but when we do, it works well. This allows us to have several meetings per week and reduce overall travel between Asia and North America. "Easy to conduct online meetings!" After being a Zoom user for about three years, we switched over to BlueJeans because we preferred the interface. We found BlueJeans to be easier for folks to join in on meetings with less technical hiccups. The system just makes our lives as a small, struggling non-profit easier and allows us maximize our resources. The lack of an affordable option to conduct two separate meetings at the same time. We have run into this problem a couple times, but not enough to justify the purchase another user account. It would be nice to have the option to be able to hold two separate meetings with a one-time pay per use model for existing users. The ability to have more productive meetings than phone conferences and to have more attendance from folks who lead very busy lives. It means that we have more ability for collaboration and productivity with limited resources. Almost all the feature I like and love to use BlueJans as my conferencing tool. I my opinion it is one of the best conferencing / Video Conferencing / Webinar tool out there. I love the mobile app of the bluejeans as well. Low Bandwidth mode on mobile app. Using mobile app one can connect from almost anywhere. We can connect to large groups that too using video conferencing. Sometimes when there is large group it effects bandwidth...then the call quality drops. In mobile app everything I like, accept one thing if we have recent calls / meetings list in desktop app that would be great the absence of that is really annoying at times. 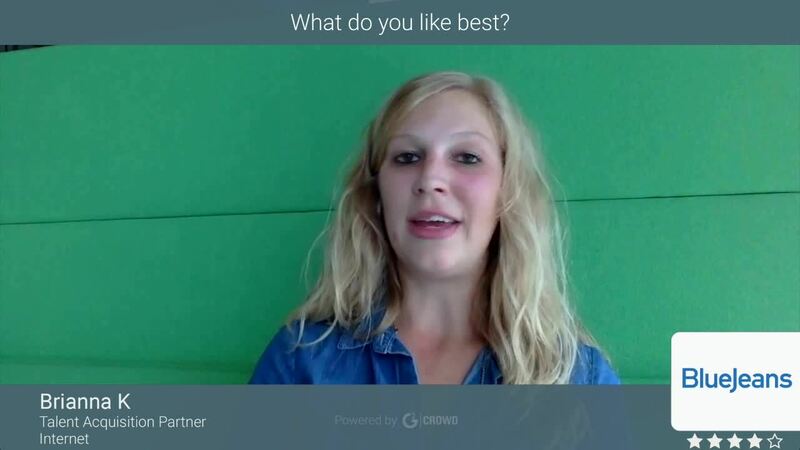 definitely recommend bluejeans to other as it provides all feature in one where we can share screen, video and talk to each other all together. It makes you connect face to face without necessarily be there on the same location. Ease of use; you can schedule audio meetings, video meetings and share your screen to share presentations or review issues. Meetings are easy to schedule and join. The ability to record meetings and/or presentations is very useful especially for training seminars; recordings can be sent out to participants for review and/or reference. Bluejeans is not 100% reliable; we experience intermittent issues where there's no sound, you get kicked out of a meeting or screen share does not work. There are many times during screen share that the software stops sharing, there is no visual cue to the presenter when this happens. It would be nice if there was an alert given to the presenter when screen share gets disconnected for whatever reason. Many times a meeting will continue as people do not want to interrupt, but have not been able to view the presentation you've been speaking about. Make sure your software is always updated, when experiencing issues, leave the meeting and log back in - 99% of the times issues are resulved. We have many team members all over the world; Bluejeans allows us to host meetings with offsite team members in a real time environment to simulate a face to face meeting. This application allows us to collaborate in a pseudo real time environment, second best to being there in person. Helps bridge the distance gap amongst team members. One good thing that I like is that the installation is fuss-free, usually integrated with the browser (not too sure about the mechanics behind the scene as I am not IT savvy) while doesn't cause too much trouble loading. The user interface is very good and easy to use too. Adequate dial-in numbers for me and my international colleagues to get connected. No big dislikes about BlueJeans but maybe an area of improvement could be the quality of audio and video but I am not sure if it has something to do the with my company Internet speed. Recommended product. Good for both individual and corporate use. We saved a lot on corporate travels. Most of the days we use BlueJeans ranging from short meetings (i.e. few minutes calls) to even workshops and trainings that last for many hours for a week. The benefits and savings are considered huge when we do not need to fly all the colleagues to one location for the sessions. "BlueJeans is a very effective software, sometimes difficult to use"
I only have a suggestion. It would be great if a large message could pop up on the screen or a voice could remind those that are remoting in to mute their phones or mics when they first enter the meeting. There have been several occasions where the meeting is already in full swing and someone joins later and we can hear them driving, eating, texting, etc and have to request they mute themselves. Their microphones need to be muted the moment they join the meeting so there isn't any interruption. Bluejeans helps me conference and collaborate with my team breaking down the barriers of location and travel. Hi Rahul - thanks for taking the time to leave your review. I hear you on the interruption late people can cause! While we don't have a message, we do have an advanced meeting option called "mute participants on entry". By selecting this when scheduling a meeting, everyone that joins your meeting will be muted by default. Hope that helps! Bluejeans great user experience in terms of inviting users along with outlook. Ease of using the Bluejeans on Android to give us the flexibility of attending meetings on the go. New features like annotation and whiteboard are taking user experience to next level. While there are multiple users attending the meeting, and no one is sharing the screen, you can pop-out the camera of the speaker on bluejeans screen. Currently, the camera of all attendees remain static and we have to look at bottom of the screen to identify the speaker. Sometimes, an unexpected error message occurs while joining the meeting. From the user's point of view, the message should state the exact reason for the error and possible corrective action. No option to postpone the software updates, sometimes we have to perform updates just before the start of the meeting and it causes delay to attend. Before joining any meeting, do ensure that bluejeans software is updated. In other words, your bluejeans is updated with the latest version available. The Bluejeans does not give you the option to postpone updates and if you are on the verge of meeting time you may get late. The greatest problem we are able to solve is to Minimize the Business Travel of executives as they are now able to communicate, meet, and discuss things digitally. Allows internal and external individuals to easily join without having to download additional software. I like the fact that the meeting room is always active and that I have a unique room code that I can use for myself (I don't have to create a new one for every single meeting). This allows me to memorize the unique code and run to meetings without searching through emails trying to figure out which code I should use. This is also my second time submitting this survey because I did not receive my amazon gift card. If there is a reason I have not received the gift card yet, please email me. Thank you. Occasionally the A/V quality is poor but this may be related to a latency issue. The scheduling aspect is not necessary as the "room" is always active. I usually just send the room ID code to participants. Allows internal and external individuals to easily join without having to download additional software. "Usage of BlueJeans at Penn"
I love that there is an online component to BlueJeans that doesn't require me to download it resulting in a phone call with IT. It is sometimes difficult to understand how to use all the different features on the website version of BlueJeans but this may be because I haven't used it more than 5 times. I would consider at least doing a trial version to see if it fits your companies' needs because I find it to be a great product for meeting with others. I simply schedule it, send a meeting link, and login to the website version of the product. I am able to have student meetings when students are not here on campus. I love this because it ensures that my case timeline continues to move forward so I am resolving cases in a timely manner and my supervisors are happy because cases are not taking too long to investigate and close out. It is really straightforward to use. When I first got my account, I was guided through the basics by a BlueJeans rep - I would recommend this for all new users. It takes 10 minutes to learn the basics, and it's nice to have an expert to walk you through it. I have been using the platform for a few years now, we typically use it at my workplace for program meetings (so 20-30 people online and 30-40 people in person), we disable the video/microphone feature for all the users that are remote, but we have the chat enabled and a dedicated person in the meeting room that reviews chat comments and relays the important ones to the entire group. It's worked well for us. There isn't a day that the either the video or audio or both are having trouble. Granted, sometimes those issues are on the end of the user at home, but often they are simply to do with the BlueJeans set up. We use the BlueJeans kit (external microphone and camera), so we usually have to play around with the settings before we can get video/audio working properly for all participants. Train your team to use it! It's so simple, but people get intimidated by new technology. We have limited meeting space for the size of faculty in our program. Our program allows people to work remotely (some work from the other side of the country), so BlueJeans has helped a great deal in getting people to attend the program meetings. One a smaller scale, we have been able to meet in smaller groups online when the campus is closed down (ie. for a snow day). "Reliable performance, simple to use, but sometimes limited in features/flexibility"
Bluejeans has been one of the best experiences for consistent sound and image on a videoconferencing tool. It also has a handy wifi bar on your screen to check your connection. The screensharing function is also great - I really like being able to specify which window or program I want to share, vs. my whole screen. I chronically have 10+ windows open, so it gives me a sense of control and privacy. It also makes giving a training really easy, as I can share the presentation on Bluejeans, but check notes on my laptop. Some features require owner/admin permission, like recording a session, and it can be very frustrating at times to want to record a meeting when it means the owner has to log in separately to click the button. Given that my office meetings are often scheduled in rooms and controlled by the AV system, it can sometimes be a scramble to make sure the owner is also logged in to start recording. I also can frustrated by the screen layout when viewing a meeting on my laptop. As a remote participant, many times I want to be able to keep an eye on content that is being shared while multitasking. Instead, there is a floating option that defaults to showing the speaker's icon or camera, and overlays on top of any other windows I am working from. The content itself shows in the Bluejeans app, leading me to awkwardly move windows around until I can see the content and my other windows. The floating overlay tends to get in the way more than helping. Bluejeans addresses remote meeting attendance for the most part. It also makes organizing and recording global meetings across multiple offices seamless. A benefit I think it doesn't get used often enough for is for giving trainings in a conference room. Having the app determine exactly what content you want to share allows the presenter to show slides while viewing their own note comfortably, and allows them to record trainings with both the slides and presenter camera, which helps engagement. Controlling shared content also shines when switching windows - rather than awkwardly closing out your slides to then demo from a browser, you can simply switch the content window being shared on the meeting. We've been using BJ for as long as I've been with my company (2.5 years). Whether I'm in the office or working from home, I've had good success with the software. It keeps users engaged, generally does not require a lot of bandwidth, and is effective for a company the size of mine. 2 things-- one, the name. We've taken to calling it "BJ" in our office, and you can imagine the plays that gets. Secondly, I would like it if you could copy and paste from the chat room. It's really annoying to have to open up Microsoft Teams or Outlook to copy a URL someone should be able to post in the chat room. We are spread out over 3 offices, plus 50 people that work from home. We cover 4 continents, and we've been lucky that we collaborate as well as we do on the Blue Jeans platform. I personally prefer it over Skype. "Just a few tweaks and Blue Jeans would be pretty much much perfect for my needs." The fact that I can see my students in real time, and they can see me, plus the flexibility to meet with them either in one of the college's dedicated D.E classrooms, or in a computer lab where I can get "face to face" with individual students. * See dislikes as well for this last comment.. I don't like not being able to show videos from DVDs. Being limited to YouTube is a significant issue with me.. *From likes - When "broadcasting" to students in a computer lab situation the system uses an enormous amount of band width, which limits the number of students to less than 20. At the beginning of this term I actually crashed the entire system at one of our satellite campuses and we had to move to a D.E classroom. If the ability to show DVDs not important to you, Blue Jeans is a more than acceptable product. As I am an educator, as opposed to a business man, this question really doesn't apply to me. BlueJeans is a solid video conferencing tool that generally has the same features as its free or similarly-priced competitors. I have particularly appreciated its ability to record meetings and store them indefinitely, which I've use to create webinars that can be shared later, conduct research interviews that I've then had transcribed, and catch colleagues up on missed meetings. I frequently use Bluejeans for international meetings, and have not had difficulty with audio/video quality except what I assume comes from difficult internet or computer settings from individual participants. No complaints... but I also get Bluejeans from my university (UPenn) rather than paying for it myself. I don't know if I would pay for this service when there are many free alternatives unless I needed the recording feature for research purposes. Bluejeans is a solid product with few interruptions in quality. I particularly appreciate the recording options, which allow me to create and share recordings for webinars, research interviews, and meetings that colleagues cannot attend. The recordings are never deleted, and they can be shared publically or with select individuals, as well as being downloaded and then distributed. Simple interface. Google Calendar integration is excellent and really easy to use. As a moderator, it is easy to see who is in the meeting, who is talking etc. The meeting interface for creating new meetings is simple and easy to use and schedule events from. Same for the recordings section for previous meetings, these can be downloaded and distributed with ease from that screen. Connectivity issues seem to be a constant battle and often ourselves being kicked out of a meeting and having to dial back in. The default meeting settings aren't very user friendly making starting meetings an issue often. (especially requiring the moderator pin code to being a meeting which a lot of people don't know to disable before the call). Communication with international colleagues and often multiple offices dialling in. One good feature as well is in large meeting rooms with multiple people, with the right AV eqipment, it will zoom in on the person talking in a large group so you can see who it is. Bluejeans allows me to connect with my colleagues across the globe with different options - app, voice call or just a screen share. Both the desktop and the mobile apps have been really useful to connect from either office or home. The Bluejeans recording functionality allows me to review the discussions done in the meeting at a later stage or even to train people who weren't able to attend the meeting. Sometimes the internet bandwidth used by the mobile app is so high that I need to turn off my video so that my connection is strong enough for the other participants to hear me clearly. The mobile app is really useful to connect from any location. "Bluejeans is a simple and efficient video call tool"
- I am seeing "file share" or "annotate" in the other question tab, but I am not aware of these capabilities and I think our "base" version does not include it. Use the Outlook plug-in ! Calendar integration is the most efficient and time-saving tool ! "Great mobile app, has limitations"
BlueJeans has a great setup if you are using it in your conference room, with being able to hook it up to monitors/TVs. The mobile app is a pretty stable and easy to use for video conferencing. You can enable "low bandwidth" which is great while traveling or on the go. Connection can be shaky sometimes. Sharing screen can get confusing. It shows the person talking/making noise the largest on screen, would be great to see everyone at same time. When you are using the in-room system, you can't see the user chat, which can make it confusing or having to then use another communication system at same time. We have a very global team and coworkers in many different locations. Blue Jeans helps us connect and stay visual with having all of our screens up. With also having a phone dial in, it allows for some people to use phone and others to use desktop/full app if they want. The technology is simple to learn. Once downloaded we were able to schedule our first meeting within an hour. Additionally, the technical support team is super helpful. We had a problem with guest logging in and tech support replied immediately. We even had conversations after mid-night (eastern standard time). I would like to create banners that can be used during the broadcast. After the broadcast, it would be great if an audio file and transcript could be automatically created. Being able to create a banner allows us to have a more professional looking video for replay. It also allows me to highlight important messages and thems. This is a great starter tool. I've been using less than a year and so far so good. I encourage everyone to use the resource available to learn more. I found somethings on YouTube that help as well. Generally, when we host a new person, we recommend they use Blue Jeans for their meetings. The ability to bring our team together and share in a virtual space. This helps with sharing information and as well and creating a recorded file for the archives. Being able to record the video allows us to share the video at a later date with other teammates. We are able to go back and look at archives to clarify points. I appreciate the Bluejeans has recording and sharing screen capability. The scheduling tool is helpful. I appreciate that contacts are pulled in to email directly. I like being able to set up meeting characteristics as starting the meeting without the moderator and muting those joining the meeting. It is helpful that you can call in as a back-up in case of internet issues. It is helpful to have a sound and mic check prior to starting the meeting. Additionally, it helps that an administrator can mute others as needed during a meeting. It is also helpful for anyone to be able to share their screen during a meeting or message individuals in the chat box or the group. I wish there was a way to email the chat communication to the leader. There is a limit of the number of users to be seen in the screen at one time. I wish the message space for the scheduling tool was easier for the receiver. If you are thinking about the title, the scheduling tool locks up and you have to start over. I would appreciate knowing who declined the meeting when it is sent. Allow more pictures to be seen on the screen and re-size the pictures. Send a copy of the participants and chat to administrator. Allow recording to be edits, cut into sections. Being able to communicate with staff no matter the location. Record webinars for future use. 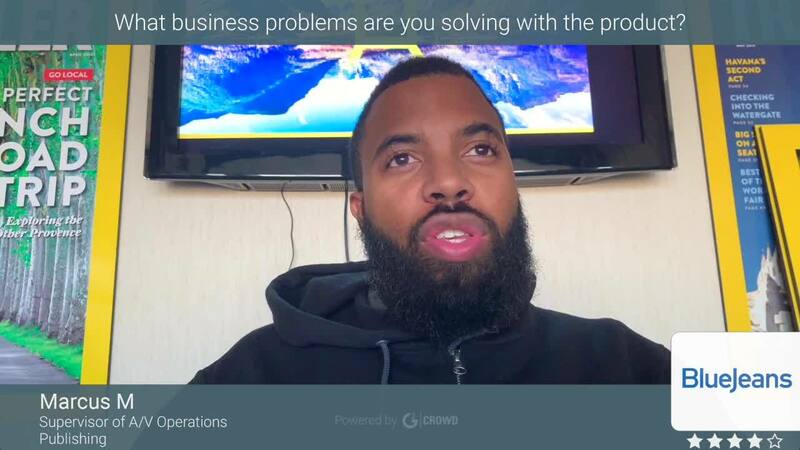 "Solid video conferencing tool with the same challenges you get with most conferencing tools"
Easy to share screens, as well as specific programs. Easy to set up a quick chat with a colleague. Video conferencing pretty consistent. Interface is fairly simple, and I can quickly get a meeting up and running with pretty quick response to joining. Some clients have difficulty logging in through the web, meetings are not "private" by standard (ie if I have multiple meetings back to back someone can inadvertently dial in on my current meeting), no function to have blue jeans "call me" (ie I need to pick up the phone and dial in each time). Some colleagues have advised of issues during the most recent update to the system that it now drains their battery life. As a result of this, I have not upgraded my version. Consider the cost vs. other products, ease of use and ability to roll-out across your company. If you have a need for quick and simple video conferencing, this may be a good tool for you. I love that people have the option to video call or call from their phone. It's very user friendly and doesn't require a username. I also love that there is a mobile app, making it easy to listen to conference calls and meetings while on the road. You can also record videos. I also like that I can integrate this with Outlook so that meetings populate on my work calendar. Sometimes it freezes up, but honestly, don't have any complaints. i guess it would be nice if it pulled in names from your address book that were not saved as contacts. It is simple and easy to use. It is also great for webinars and recording presentations. Use this product for video conferencing both internally within your company and externally with partners and clients. I'd also recommend using the mobile app for employees who are out in the field often. We have a staff across the globe, so it works well for allowing us to connect with teams in other countries. It's also a great way to have conference calls with our partners at institutions so that we can connect on student issues. We use it for orientation webinars and are able to record these so that we can save them for students to refer back to. It also helps us to share our screens with those we are speaking to so that we can all view the same thing. Blue Jeans is really easy to understand and to use. It allows you to create meetings in different time zones, to avoid misunderstandings. You can set the conference so the attendants can speak without the host or not. With the last update, entering in a call is faster, at least if you have the link. If you don't create meetings frequently and don't select the options for everyone to speak without you, it can be an inconvenience. This set up should be more visible, I've had to change links more than once because the one that sent the invite wasn't connected and didn't set it up properly. I think is a great tool and it works better than another ones I use. No install is needed, so you can share links with anyone, clients or co-workers and they'll be able to join. The set up is really easy and you can use the instant meetings if you are in a hurry. I'm not aware of the cost, but if it works for your company or yourself, I strongly advise you to give it a try! It works really good most of the times, I use it for work and I have at least 1 call per day through it. It allows you to speak with anyone around the world and create a closer connection. You can have 1-1 meetings or conference calls with many users and it still works great. The Bluejeans app works very well to keep me connected with students or colleagues for meetings and classes. I've had several meetings with colleagues across the US, and with students locally where our University is located. Connecting, muting camera and/or microphone functions, and sharing the computer screen or specific programs (such as only sharing MS Word document) is intuitive. Prepping the computer beforehand by testing software and hardware components is a must for good operation. We have older equipment (computers that are greater than 6 years old). Oftentimes Bluejeans does not work on this older equipment. That is not a fault of Bluejean, but older equipment does not allow Bluejeans to work as well. Additionally, if the Internet connection is slow, then Bluejeans does not work as effectively. There is a low-bandwidth mode that does help in these types of situations. I can connect with people effectively and share data which greatly assists us in having meetings with people in various geographic locations. Students don't have to dress up and come into the University for a study session. Colleagues do not need to drive 2 hours, one-way, for a one hour meeting. I even connected to a meeting from Tanzania, Africa to the US and was able to participate (although low Internet bandwidth problems did not allow good audio quality). Travel costs are cut, and participation has increased. "A much easier teleconferencing platform than I've used before"
We have a BlueJeans integration with Outlook, which is the best feature of the platform. It automatically syncs to the app on my phone as well as my computer so I never miss a meeting and it's very easy to join the line. When I do have to enter in codes, it's pretty simple and there's an integration with our conference rooms, which means that I never have to sit on the line waiting for prompts to login. The only major issue I have had with BlueJeans has been its finickiness with Bluetooth microphones, specifically the AirPods on my MacBook. If you're running a larger call, make sure to mute all others on the line - including video and audio. For screenshare, if you only want to share one program, choose to only share that one app's screen instead of sharing the entire screen in case you have sensitive information on it. Most of our team works remotely, and BlueJeans has been a great way to talk to people face-to-face while also being able to chat with a group and share screens seamlessly. We've switched from other conferencing platforms which aren't as friendly with calendar invites or lack certain feature-sets. The previous conferencing platforms played well with 1:1 communication, but BlueJeans allows my entire team to dial in remotely, have a productive meeting, share screens, and work on projects together through our laptops. 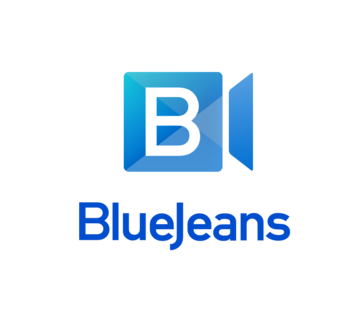 "BlueJeans is a great solution for audio and video conferencing"
BlueJeans has really simplified our global audio and video conferencing environment. I head our global infrastructure team and used to spend a lot of time fielding complaints about how conferencing solutions were hard to use in meeting rooms, didn't have a sufficient mobile app, or had bad audio or video quality. We went all-in with BlueJeans about 9 months ago and it has literally changed everyone's perception of conferencing overnight. It has also turned out to be a great way to share screens. We were having users with issues sharing their screen over Skype for Business with our teams in India and other locations, and BlueJeans became a great solution to that problem. The best part is that the audio quality is MUCH better than anything we've used before. Video is great but is also dependent on a lot of factors (camera quality, lighting in the room, network connection, etc. ), but audio quality is the thing that just has to be great. Whether participants are on their laptops, in a conference room, or on their mobile device at the airport, we are getting great feedback from the users that the conferencing quality is great. It's not great a sharing videos through the video conference. For example, slides and static content is great, but if a presenter tries to share a video, it can sometimes be choppy. BlueJeans has some solutions for this, like pre-loading the content or using their Events solution, but on-the-fly video sharing is something that could be improved. Not something that happens a lot and is a challenge for all video conferencing providers, so not something that should scare anyone away from BlueJeans. - Identify a solution that works well in a heterogeneous environment of mobile devices, PCs/Macs, Cisco meeting rooms, lower-cost "huddle" room VC units, etc. All the benefits above were realized. It's honestly been a while since I found a solution, UC or otherwise, that lived up to the promises of the sales team, but BlueJeans has exceeded our expectations. "Bluejeans is an excellent option for cloud collaboration"
This platform is very easy to use, is friendly to end users and has multiple helpful features for web collaboration, the screen sharing works very well, the quality of audio and video is very very good, and something that i consider a good feature for us is the capability to interconnect with another vendors and the capability to use Room System to access bluejeans meetings. I think the price, because is a little expensive, but i understand cause the quality is very good, another think that we dislike is the limit of users that you can connect to the meeting, you only have 25 seats and if you need add more users you can´t do it, the solution is not very scalable in this case, we prefer when you need add more users we can have the posibility to pay for these extra users, but the platform doesn´t permit that, it just does not accept more connections. "Best Video conference service out there in the cloud!" The ability to connect over video for meetings with cross country teams with minimal lag is great! Scheduling and joining the meetings is very user friendly and intuitive. Ability to record the meetings and refer later helps the teams to go over some of the intricate details of the discussion and it helps them understand things better and put them in perspective. Ability to share the screen to discuss some of the important issues at hand, go over the plans and requirements is very useful. The desktop app interface in the latest update looks cool and works seamlessly. Sometimes i face issues with audio. Need to disconnect and rejoin for it to work and this is a common feedback I hear from my colleagues. Recommended for any business where you need teams constantly collaborate on video and highly recommended if you have teams geographically dispersed. It's helping my scrum teams scattered around the globe to experience real time collaboration through Blue Jeans video conferencing. Ability to have large number of users join and appear on video simultaneously is positively improving team collaboration and bonding among global teams. The mobile version proved extremely useful especially who are constantly traveling and can't get on their computers at times. The only drawback to bluejeans is that it has recently started competing with O365 Teams within our organisation. Teams provides all of the functionality that Bluejeans does, but also provides a lot more integration with O365 including reporting tabs, team conversation and persisted file sharing. I'd always suggest carefully considering your needs. If what you need is a video conferencing tool, and won't find benefits from a tool that integrates with office applications, then this is the tool to use. If you need greater integration, other tools may worth considering. The main problems we've been solving with bluejeans are around getting people from various areas of the globe into meetings and organising working calls. I currently use bluejeans to provide training on a data collection system to over 500 individuals. BlueJeans allow all user to easily access all trainings easily and without errors in connecting. I have used other platforms before and experienced at least 3-4 issues with site accessibility. Once we changed to this platform, it is intuitive to use, join, and participate. I have loved this platform. We conduct many trainings remotely. For my current project, I must train court and provider staff using this platform, all of which are remote (I'm based in Philadelphia and these individuals are based in Ohio). In addition, many staff are coming from areas with limited wifi capacity. In other platforms, this resulted in the system not uploading correctly or spotty at best. BlueJeans has proven instrumental in addressing these issues. BlueJeans is a very easy to use video conferencing platform. It takes only a few seconds to start or join a meeting and I always experience good audio and video quality. I like how my meeting information is always the same and I am able to change my meeting ID/passcode to my preference. It makes it easy for me to quickly share my meeting details with a single person or a large group of people. As a meeting moderator, it is simple to share your screen, mute or un-mute attendees, and chat with the entire meeting group. BlueJeans is a great platform and is scalable across organizations of different sizes. It is easy to schedule meetings, whether a one-time meeting, or a repeating meeting. Customizable passcodes make it easy to remember when you are the host and have limited time to start the meting. BlueJeans makes it easy to connect with colleagues or clients from coast to coast. BlueJeans makes setting up a simple audio call, video conference or screen-share meeting a breeze! You can forget about note taking — with the click of a button you are able to record both audio and video conferences. "Potential is amazing but design need more emphasis on ease of user experience"
Love the ability to connect multiple people across varied geography, device, and medium. Being able to pick whether I connect via mobile on the go, laptop at home, or built in conference room system is a huge plus. Also really appreciate the option of video as well as the attempt at following who is speaking and displaying their video. -Primary sound or microphone device doesn't match rest of the laptops configuration so that transition from other uses is seamless. Overall, understand that some of this is avoidable and user error but would prefer that as much of this as can be solved through better design. Aim should be to anticipate scenarios that user have and make it more seamlessly flow into the right choices or just work. Feels too "difficult" to get to what you need or intend. Connection of employees across the globe and in different locations even in the same city. Ability to share content and discuss just like we were all in the same room. Have seen these benefits but more excited about how much greater the tool could be with some hopefully small adjustment on the design side. I've used Bluejeans on multiple occasions as a platform for online presentations and training. I manage a volunteer program with members all over the country. Through BlueJeans I can host training sessions that are also easy to record to send to any volunteers that weren't able to attend. Creating a session is easy and the link is ready to share. My users don't even have to have an account or download any software to join me! Because BlueJeans is a video conferencing software, there isn't a way to automatically mute other people's video feed on entry (even tho you can mute their audio). When I am presenting to large groups it can be too cumbersome to have everyone on screen but that means I have to keep reminding people to mute their own cameras. It has been critical to have some sort of webinar platform since I work with constituents around the country, as well as international. BlueJeans has allowed me to better connect with those volunteers that I would otherwise not get the opportunity to meet in person. "Functional but with some issues"
Scheduling through Outlook is easy. Gives dial-in options to international users. I love that if you click on the link to go to the app, the dial-in is one click (automates entering in conference number and password). Video conferencing is a nice optional feature. Administrative options are also useful - being able to see who is talking, being able to mute specific people. Bluejeans also allows the user to specify a certain call-in conference number (setting to your cell phone for easy memory, for example). Sometimes the dial-in doesn't get recognized if we have a shaky connection. This has been attributed to a bad phone network, but we've had users have issues dialing in with cell-phones as well. Bluejeans Outlook plug-in doesn't work as expected sometimes. Setting up the conference number in the app doesn't link to the Outlook plug-in. Being able to easily setup conference calls has been great. It has the additional benefit of easily integrating international callers. Recording sessions has been occasionally useful. Excellent tool for video conferences, I personally had the opportunity to experiment with the tool, since at the last moment they told me that I should attend a regional conference and only loaded the laptop with me, my IT people remotely, could install the tool and without many problems, I could enter the conference room, realizing that it has great potential for distance communication, since it was a regional conference, it is normal that the connection of these programs is a bit tedious .. .. thing that with Bluejean was not, it was as simple as placing the code of the room in which the conference was being held and I started session, giving me a good experience, since the video is really clear compared to other tools that I have used previously, and the quality of the voice is unmatched, a very comfortable interface and so, its technical support service is really punctual when it comes to answering n determined problem. Its great flexibility and its easy handling, since in a conference in which I had to attend unexpectedly, I was able to use it without problems, I also liked the clarity in the delivery of voice and video. * We monitor all BlueJeans reviews to prevent fraudulent reviews and keep review quality high. We do not post reviews by company employees or direct competitors. Validated reviews require the user to submit a screenshot of the product containing their user ID, in order to verify a user is an actual user of the product. Company: Blue Jeans Network, Inc.
Hi there! Are you looking to implement a solution like BlueJeans?